Super Savvy Mommy: Tidy Books Winner! We have a winner ladies and gentlemen! 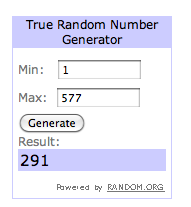 I usually don't make a huge post about the winners because I hate to burden my email subscribers but here is the winning number! I had 577 entries which is my largest contest to date!!!!! YAY!! Amber Porter of Skip The Laundry, you have 48 hours to get back to me otherwise I will have to choose another winner! Congratulations! Congrats on so many entries and Congrats to the winner!! 577? Geesh, where do you list your contests at? I only use Prizey and still have yet to top 300, I think!